Many of the UK top TV and radio channels move to their new home on the Astra 2E satellite last week. 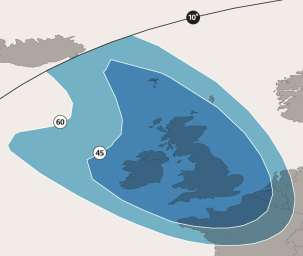 Many people who watch and listen to the BBC, ITV and Channel 4 and 5 services from outside the UK from these satellites now can not get a signal. In many ways, it was never meant to be. 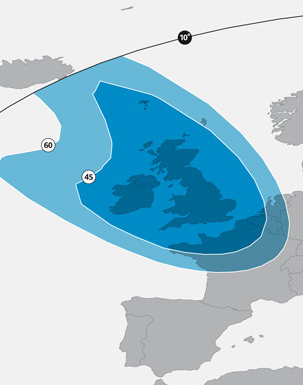 The "old" Astra 2D satellite had a special "UK beam" that was meant to keep the satellite signals for British viewers roughly within our archipelago of Northern European islands. However, the signals from 2D spilled all over Europe. A normal sized dish would pick them up France, and a 1.2 meter dish got many ex-pats and Anglophiles their dose of BBC and ITV as far south as Lisbon and the Greek islands. Unofficially this was OK. The BBC was well funded, the content providers didn't really mind too much and UK licence-fee payers got a taste of home when on holiday or on business "on the contentment". 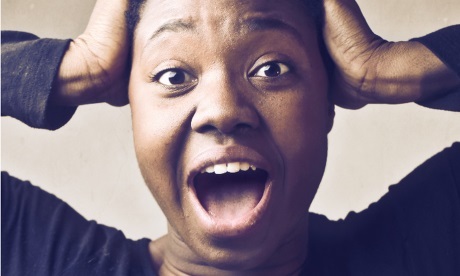 (This was never a problem for BSkyB, who still use pan-European satellites, because they restrict their services by the use of viewing cards sent out to the homes of people who can call their call centre from a UK or Ireland landline or mobile phone). However, the Astra 2D satellite was on it's last legs: launched in late 2000 it was designed to last 12 years. Two new "birds" (as they are called) were planned to replace it: Astra 2E and, yes you guessed it, Astra 2F ( see Good news for Freesat? Astra 2E satellite launched). Because of delays in launching, the Astra 1N satellite was put into the "Astra 2" orbit, and the services were quietly moved from 2D to 1N (New Astra 1N satellite to offer more UK-focused capacity - and soon, BBC satellite services moving to Astra 1N on 24th February 2012 ). In the last month, Astra got the 2E satellite into orbit, and have now switched the services from 1N to 2E (Lots of fixes and updates to UK Free TV including Astra 2E and Comux) . 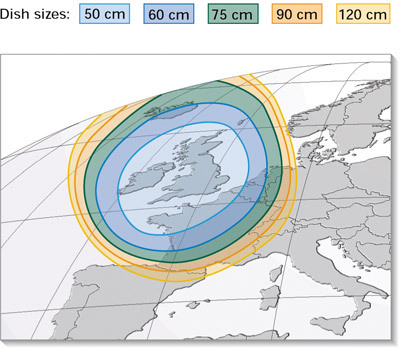 As Astra 1N wasn't really designed to provide a UK spot-beam (as they are called) the supposedly UK-focused beams were as easy to get in the rest of the EU as they always had been from 2D. However, Astra 2E and 2F now have excellent spot-beam focus. You can see details of which channel is on which bird here: Satellite footprint maps. However, as BBC and ITV satellite moves cut off expat viewers - Recombu notes, this means that viewers outside the UK no longer can watch services they could. Has this affected you? Comment below please! Just to add, some friends living in parts of Spain, have managed to continue to receive reception on a 1metre dish, where they have re-aligned and peaked reception. (Astra 2E is at 28.35 east). Dishes should me matched with a known high gain LNB such as the Inverto Black series. - However, in some locations there are others who may have little luck even with a 1.8 metre dish and may have to consider going up to a 2.5metre. As stated earlier where signal loss is total then be st to have a site assessment carried out by a reputable installer and then one is the position to consider whether any additional expense is worth the effort. Salamanca - With a motorized120cm Channel Master dish Inverto Black Uktra o.2 Single LNB. - reception is good on all channels and is actually slightly improved. Ibiza - Channel Master 1.2m. Inverto quad LNB, Channel Master Feed Horn . Sky HD.plus DRX890 receiver - All BBC Channels working OK. - No loss. Almeria - 1.2 Channel Master Inverto Premium Black Quad LNB Sky Plus HD receiver. No Reception. As can be seen from these reports There is clearly variationdependent on locus..
Our 1.2m dish in Frigiliana, 50km east of Malaga, and 2km up in the mountains, gave us good Sky reception until we lost Ch5 a few months ago (and who cared?) and then BBC1 etc a few weeks ago (and boy, did we care). We still get Sky, with Sky News and a selection of obscure channels like a Movies For Men and such, but none of the 'big four'. And we never subscribed to Sky, so there was no change regarding the payment-requiring Sky channels. Fortunately, we had (a) planned for this and (b) still have a home in the UK. So we coupled a Slingbox to our YouView box at home in the UK, and set that up before we came out this time. The Slingbox works well, even though we don't yet have fibre in our village. Currently, it's slinging to an iPod Touch on Telefonica broadband, and the iPod Touch is coupled to our two TVs here over wifi to an Apple TV unit under each TV. We have iPads, which give an exact graphical representation of the YouView remote control, but the options on the Touch are entirely workable, and we like to keep the iPads for general use, as whatever is sending the TV programme needs to be dedicated at the time. With this setup, we can watch live TV on the YouView box, make and watch recordings, and even use On Demand catchup, though that can buffer to an extent, which when you think the Slingbox has to pull the programme in over a 6mb link, push it back over 1-2mb, Telefonica has to pull it in and send it over wifi to the Touch, which then has to send it back over wifi to the Apple TV, is not bad going at all. FilmOn is a bit easier to use than Slingbox, but only has some of the live UK channels: we watch the main channels and BBC News on it, but use the Slingbox for recordings and Ch4+1, which FilmOn does not have. This setup is using £320-worth of kit, not counting the iPod we already had, but has a zero monthly cost, needs no VPN, no other set top box, does not rely on a supplier who might go bust or be forced to shut down, does not require a PC in the loop, and shows its picture on our TVs. And apart from On/Off and Volume, where we use the traditional remote, the iPod Touch is effectively our remote now, and where two taps will enable us to move the programme from bedroom TV to lounge TV at will. With the Sky, we had Digisenders to distribute the picture from lounge to bedroom; we've elected for an Apple TV on each, but I might have been able to use the Digisenders, except I think the TVs don't pass on the HDMI picture, even over SCART. But this way, bandwidth willing, we can even watch different programmes on the two TVs by using the Touch on one and an iPad on the other. We have found some Internet usage, on PCs and the like, can make the TV service stutter a bit. But it has to be very intensive to do this, and doesn't happen with normal browsing, etc. It does seems to need Apple products to work well, though; I have Screen Mirrored FilmOn from my Android Nexus 7 to a Samsung a Smart TV here, but it is very slow and clunky compared with the iPod experience. And if a Nexus 7 won't cut it, what Android device will? (Though maybe Samsung tablets play nicer with Samsung TVs; I don't have one to try). Re the Apple TV unit (about £90) , it would be cheaper to use an HDMI converter cable (£40), but that's a much much less convenient wired solution. And the Apple TV has all sorts of other advantages we've only begun to scratch the surface of, like being able to rent Blue Jasmine in HD this last weekend. As a last, bonus point; we get a much better picture from either Slingbox or FilmOn than we ever got over Sky. Losing Sky has been a good thing; it's made us think about alternatives, and actually find a better-looking, more versatile solution for half the price that the satellite solution cost us in the first place. I've noticed this time we only have BBC World, CNN International, and CNBC Europe, obviously due to the satellite changes. Not really much use. Surely A system could be introduced that when UK citizens are abroad, you simply key in your TV licence number and this would give live access to online streams without rights restrictions ?